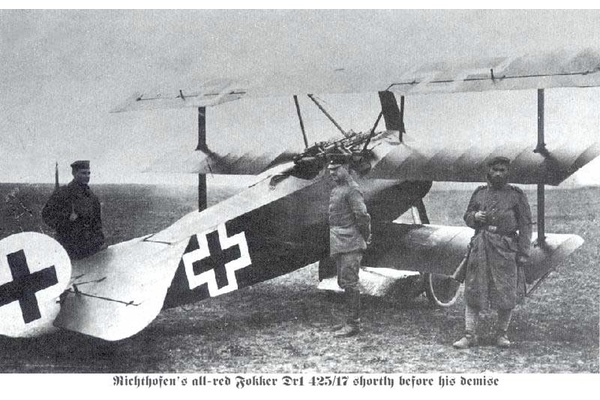 The World War I German flying ace who would become known as the Red Baron received this nickname after painting his plane a bright red color. While often eager for the bloodshed that he knew would be necessary in order to bring down his enemies, his willingness to place a stone on the grave of an Allied soldier who fell at his hands reveals a more compassionate side that was often lost amidst the horrors of total war. The Red Baron was born Manfred von Richthofen in the Bavarian town of Kleinburg in 1892. He was from a well-to-do noble family, and his father was a former officer in the Uhlan Regiment. At the young age of 11, Richthofen, along with his two brothers, entered the Cadet Institute at Wahlstatt. He proved to a talented gymnast and also became a skilled hunter, a fact that would foreshadow his ruthless and calculated approach to warfare in the future. "It was a glorious feeling to be so high above the earth, to be master of the air. I didn't care a bit where I was, and I felt extremely sad when my pilot thought it was time to go down again." A few months later, in August, Richtofen met the renowned German flying ace Oswald Boelcke. Richthofen began training to become a pilot later that year and passed the examination on Christmas Day. The two returned to the Somme where the pupil served in one of the expert's newly formed squadrons. Boelcke was idolized by Richthofen, who wrote that the leader's words were "taken as Gospel" by his men. Ironically, he would receive no credit for his first kill, which occurred in April of 1916 while he was flying over Verdun. Soon after Boelcke's death at the end of October, Richtofen encountered the "British Boelcke," Major Lanoe George Hawker, a British flying ace who had been responsible for the demise of many German planes. After a fierce battle, Richtofen shot Hawker and was able to claim his most important victory to date. Continued success quickly allowed him to form his own group, which became popularly known as "The Flying Circus." When Richtofen was alerted to a bombing raid that several British opponents had planned for him, he refused to leave and instead dined with his senior pilots as they prepared to wait out the ambush in their dugout bomb shelter. Richtofen became a desperately needed symbol of hope for the Germans, whose prospects for victory were becoming increasingly dismal. In July of 1917, the seemingly invincible Richthofen was wounded when a bullet struck him in the head and splintered part of his skull. Even though he continued to suffer from debilitating headaches, Richthofen returned to work within two months and continued to be remarkably successful. Richthofen would ultimately go on to be credited with eighty victories during the war, a number that placed him on the same level as the leading British flying ace of the day. On April 21, 1918, Richthofen was shot and killed while taking part in a mission over the Somme region in France. This occurred the day after he secured that eightieth victory. The identity of the person who fired the fatal shot remains unclear. Many suspect that the captain responsible was the Canadian Arthur R. Brown, who went on the attack after Richthofen began to target Brown's less experienced friend Wilfred May. Others believe that one of the Australian troops stationed on the ground fired the shot. Regardless of who was responsible, there was a deep respect among the Allied soldiers for the enemy flying ace who had finally met his match. The British held elaborate funeral and burial ceremonies for the man who had been responsible for the deaths of their comrades, with full military honors. Some have speculated that Richthofen did not in fact achieve all of the victories that were attributed to him. However, because German and British records include so many of the same downed planes, many historians are inclined to believe that the Red Baron's legendary success was not hyperbole.